Each of our founding partners, attorneys Louis "Buck" Vocelle, Jr., and Paul R. Berg, hold dual certifications from The Florida Bar as specialists in civil trial and business litigation. Backed by their impressive credentials as well as their decades of combined legal experience, they lead a team of highly seasoned, dedicated associates, all of whom are devoted to delivering the personalized attention you deserve in order to help increase your chances of obtaining the favorable outcome you seek. Over the course of our history, we have recovered millions of dollars in settlements and awards for our plaintiff injury clients, earning our membership in the Million Dollar Advocates Forum. Likewise, we have obtained many positive results for our commercial clientele embroiled in complex litigation. From this high level of client commitment, our founding partners are each AV Preeminent peer-review rated* through Martindale-Hubbell, and our attorneys have earned reputations as being among the top trial lawyers in the region. 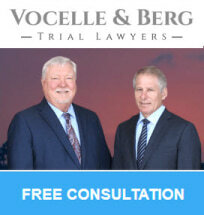 For more information on how Vocelle & Berg, LLP, can best serve your needs and help you secure a brighter future for yourself, your family and your company, you can contact our office by phone or through our website to schedule a free initial consultation. We also work on a contingency basis for our injury clients, so you will not owe us anything unless we win your case.